Note that this pass's result cannot be invalidated, it is immutable for the life of the module. Definition at line 344 of file TargetLibraryInfo.h. Definition at line 346 of file TargetLibraryInfo.h. Default construct the library analysis. This will use the module's triple to construct the library info for that module. Definition at line 352 of file TargetLibraryInfo.h. Construct a library analysis with preset info. This will directly copy the preset info into the result without consulting the module's triple. Definition at line 358 of file TargetLibraryInfo.h. Definition at line 1534 of file TargetLibraryInfo.cpp. Definition at line 1542 of file TargetLibraryInfo.cpp. 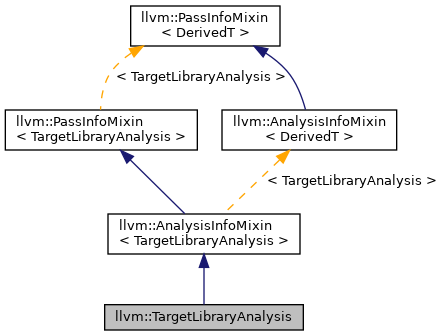 References llvm::GlobalValue::getParent(), llvm::Module::getTargetTriple(), llvm::Triple::normalize(), llvm::TargetLibraryInfoImpl::TargetLibraryInfo, and llvm::TargetLibraryInfoImpl::TargetLibraryInfoImpl().